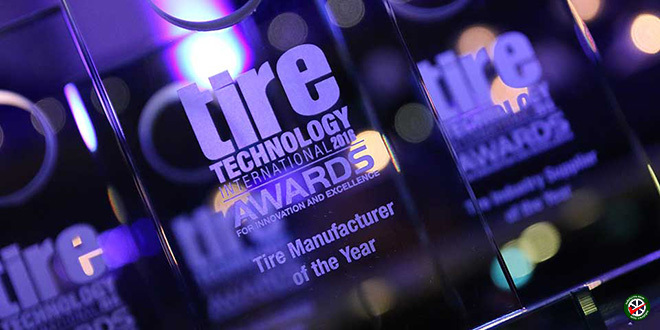 An independent jury of top tyre industry experts has voted Bridgestone “Tire Manufacturer of the Year” in the 2016 Tire Technology International Awards for Innovation and Excellence. Recognizing Bridgestone for its impressive global R&D investments and achievements in sustainable manufacturing, an independent jury of top tyre industry experts has voted Bridgestone “Tire Manufacturer of the Year” in the 2016 Tire Technology International Awards for Innovation and Excellence. The announcement was made at a gala ceremony during Tire Technology Expo in Hanover, Germany on 17th February, where Mr Eduardo Minardi, Executive Chairman and CEO of Bridgestone EMEA region received the award on behalf of Bridgestone Corporation. “Everyone in Bridgestone is hugely proud to receive this recognition. R&D and innovation lie at the heart of all our activities, it is the only path that can lead us to a sustainable future” said Mr Minardi in his acceptance speech. The judges applauded several Bridgestone achievements in R&D and sustainable manufacturing during 2015, including a $250 million investment in Tokyo, Japan for facilities to foster open innovation based on industry-government-academia partnerships. the updating and relocation of the Bridgestone Asia Pacific Technical Center in Thailand; – and for sustainable manufacturing, the Bridgestone tyre plant in Wilson, NC, USA which became a zero-waste-to-landfill facility. This is the 5th time that Bridgestone has won a Tire Technology award since the programme was introduced in 2008. 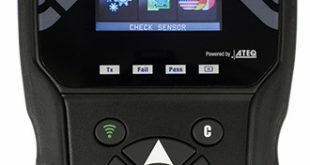 In the inaugural year Bridgestone also scooped the Tire Manufacturer of the Year award, followed by Technology awards for its Contact Area Information Sensing technology (CAIS) in 2012 and Ologic reduced-rolling-resistance technology in 2013, and the Environmental Achievement of the Year award in 2013 for the new Americas Technical Center in the USA. 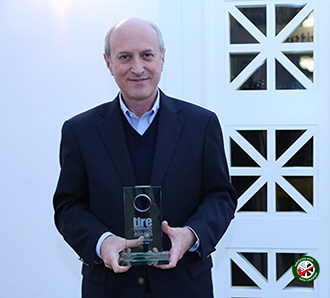 Eduardo Minardi, Executive Chairman Bridgestone EMEA, receives the “Tire Manufacturer of the Year” award on behalf of the company. Next BRIDGESTONE AT GENEVA – COME AND SEE OUR LATEST INNOVATIONS!